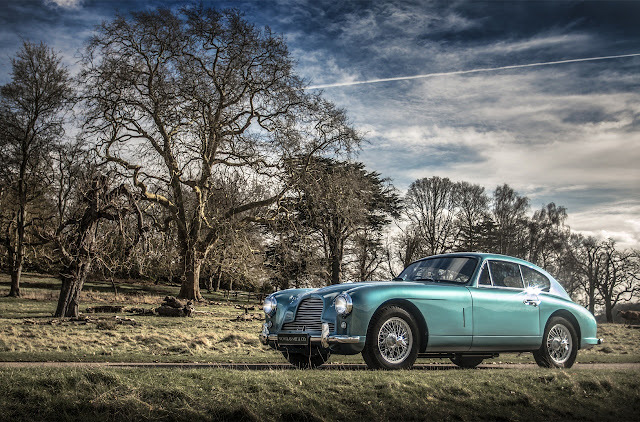 First shown to the public at the 1953 Earls Court Motor Show, the DB2/4 succeeded the two seat only DB2 and is widely thought to be the fist ever production car with Hatchback access to the rear. Retaining the W O Bentley designed 2.6 litre twin cam 6-cylinder engine, the DB2/4 satisfied the demand for 2+2 seating, whilst retaining the performance of the race bread DB2. Over the 2 years of production, just 565 examples were built. Delivered when new via Aston Martin agents Brooklands of Bond Street in 1954. Mulliner bodied and finished in Blue Haze with mid Blue hides and contrasting piping chassis LML/631 was first registered KMR 567 in 1954, this number being retained on the car to today. A succession of recorded keepers follows, before single ownership between 1973 – 1993. After some 20 years of ownership, the car was resold in 1994 requiring restoration. Commencing some 15 years later, the body off and total restoration was been completed in 2014 to concours standard by professional restorers, leaving no aspect of the car untouched. A comprehensive photographic record, with detailed statements of the restoration, clearly shows the extent and detail of the restoration works completed. Subsequently used only occasionally, for show and display purposes the car is in particularly outstanding condition. Resplendent in its original colours, with matching number engine and original registration, KMR 567 is undoubtedly one of the finest examples of the DB2/4 we have seen and is ready to be enjoyed or grace any of the finest collections. Contact Nicholas Mee and Company Ltd for more details.